The BBC Trust, the corporation's governing body, has given a provisional go-ahead for a project which could kick-start demand for internet TV. Set-top boxes, expected to cost around £200, could be available next year. The Trust reached its provisional conclusions following more than 800 written responses. Do we really need another way to watch television - and yet another box? The answer for many people will be yes. Project Canvas - if it gets the final go-ahead - will make it easier for viewers to catch up with programmes from the BBC iPlayer, ITV.com and 4OD on their TV set, where they were meant to be seen, not on a laptop or desktop, where they weren't. It could bring other internet services - such as YouTube and shopping sites - to the TV screen. Yet it would also mean even more choice in an increasingly complicated digital world. Viewers already have to choose between Freeview, Freesat, Sky, Virgin Media, and other providers such as BT Vision. And that's not including options such as Sky+, SkyHD, Freeview+ and - in the New Year - 3D - for which you'll also need a new TV set. It is proposing some conditions on the BBC's participation in the venture and will have a further period of consultation, lasting until February. The Trust ruled that Canvas would have a series of positive impacts, including furthering the growth of on-demand TV and increasing the opportunities for internet service providers to develop so called triple play - phone/TV/broadband - services. "After careful consideration, the Trust has provisionally concluded that Canvas is likely to benefit licence fee payers. We believe Canvas could be an important part of the way in which the BBC delivers its services in the future," said Diane Coyle, chair of the Trust's Strategic Approvals Committee. But the Trust did find that it may slow the growth of pay TV and contribute to the shrinking of DVD rental market. Ms Coyle said that there was no reason why companies, such as Sky, should not charge for services on the platform. "There will be scope for new entrants to make charges for services alongside the free content," she said. But Sky has shown no signs of wanting to join the project and believes licence fees could be better spent. Graham McWilliam, Sky's director of corporate affairs said the decision was "nothing short of BBC mission creep". "The key concern with Canvas is the leading role that the BBC wants to take in the project. Internet-based TV is already developing fast and, even without Canvas, the industry is working on shared standards to help it grow even further," he said. "There is no need for public money to be spent on replicating what's set to be delivered through commercial investment," he added. • The core technical specification must be published well in advance to allow manufacturers to adapt to the Canvas standard. • Other content providers must have access to the platform. • Any quality standards for internet service providers must be applied on a fair, reasonable and non-discriminatory basis. • A Trust review, 12 months after its launch, will assess the effects Canvas has on the partner's incentives to syndicate their content to other platforms. • The platform must remain accessible without a subscription. • The BBC must return for further approval if costs exceed those projected by more than 20% in any one year. • The BBC must report on whether the proposed accessibility features, such as audio description, have been incorporated. The Trust will review the signposting of content and parental controls. Users will also be able to access internet services such as Facebook, YouTube and Flickr via their TVs. The BBC Trust has been debating the public value of Project Canvas since March. 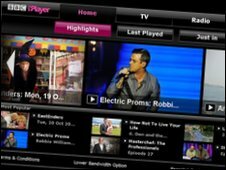 Virgin Media and BSkyB have been outspoken critics of the scheme. Virgin said it was "currently considering the provisional conclusion". An earlier scheme, Project Kangaroo, was stopped by the Competition Commission. The success of Project Canvas could be jeopardised by the increasing number of internet-ready TVs available on the market. Analyst firm Futuresource predicts that 20% of flat-screen TVs shipped in Europe next year will have internet connectivity.